This new Rainbow Tallit was inspired by Reb Zalman Schachter Shalomi’s z"l vision in the 1950’s of a being wrapped in a spectrum of light, suggested in a Midrash that asks: How did G-d create the world? He wrapped himself in a robe of light and it began to shine. The design and intention are just as Reb Zalman envisioned and later had created . 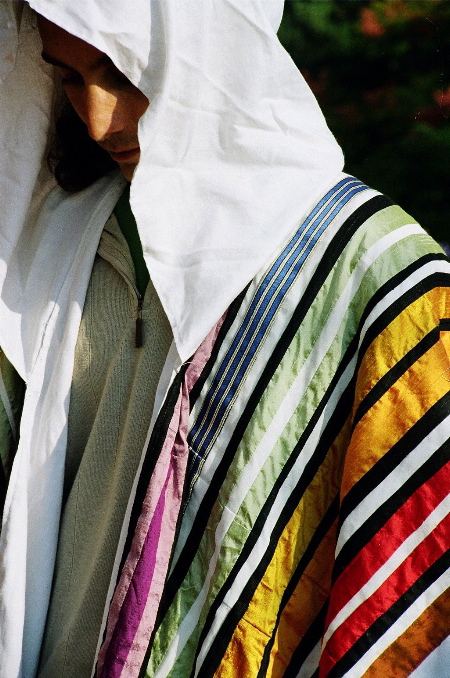 My Rainbow Tallit is a tapestry of color and prayer. Each stripe is hand sewn using raw silks set on a base of cotton, linen or hemp and finished with techelet tzitzit. The cape-like design, open in the front makes for more comfort and freedom of movement without worry of the tallit falling off. The optional hood provides privacy and intimacy during private prayer. The tallit is made to order, and can be designed as a traditional tallit, for clients the world over. What follows is the text of an interview with Reb Zalman z"l. The interviewer is unknown to me, but I provide the transcript as I received it below. You can also read a Hebrew translation of the interview in Rabbi Ruth Gan Kagan's book קירבת אלוהים on whose cover this new rainbow tallit adorns. GERSHOM: So, you had in mind that the "robe of light" that G-d wraps himself in to create the world, is the spectrum, that it is literally the Primal Light? So it comes out like this: [When the tallis is worn over the head] the atarah [embroidered strip) on the tallis is Keter, the Crown, the Source of the White Light, which flows into Chochmah-Binah [Wisdom-Knowledge], still white and represented by the tallis cloth as it is draped over the head.] It then then enters Chesed [Lovingkindness or Grace], which is the wide purple stripe. GERSHOM: There are two shades of purple. Why is that? ZALMAN: Because it represents Bereshit, "In the Beginning," the First Day of Creation. So the deep purple represents ultra-violet, just coming out of darkness. The lighter lavender (on either side of the deep purple) already has some light mixed in, the first light becoming visible to the human eye. And the whole stripe is very wide, because the nature of Chesed is broad and sweeping. Which is also why it needs the black lines to contain it. Now, the next stripe is tekelet-blue, representing Gevurah [strength/rigor]. This stripe represents the Second Day of Creation, when the "waters above" were separated from the "waters below." And since <I.GEVURAH< i>is by nature a container [because it also represents halachah, Jewish law], it doesn't need the black stripes bordering it. Following the Creation story, the next stripe is the Third Day, Tiferet [beauty]. Vegetation was created then, represented by green. G-d also said "It is good" twice on that day, so there are two green stripes, with the white light of Keter [Crown, one of the upper levels] coming through the middle. Tiferet [as the heart center] needs a vessel, so there are also the black lines. Next comes Netzach [victory], the Fourth Day, when the sun, moon, and stars were created, so they are represented by yellow. The Fifth Day was when egg-laying animals were made: all the fish, reptiles, birds, and insects. So I reprsented the sefirah of Hod [spendor] with orange, like egg yolks. Notice also that Hod and Netzach are very close together, almost like one stripe, and that they are mirror images of each other. You can't really separate them. In fact, people confuse which is which, and there's a lot of disagreement, some systems interpreting them exactly opposite of other systems. GERSHOM: Yes, I see how you have designed them very close together, almost like one stripe, but there is still some white light coming through between them. Like Aaron and Moses. Aaron does the Form of the ritual and also channels the blessings. Moses gives laws but also received revelation. Each has both active and passive elements, like the left and right brain, but more balanced, more integrated. That's why you can't really separate them, right? And last of all, we come to Malchut, the Kingdom, which is Earth, represented by brown, because all things turn brown and return to the earth when they die. King David is also associated with Malchut, not only because he was a king, but also because he received everything [an attribute of Malchut] and has nothing of his own -- not even his life. There's the Midrash that the first Adam gave 70 years of his own life to King David, so that David's very life came from Adamah, the earth. Thus the brown color. So, the pattern kept coming through clearer and clearer to Reb Zalman, and the quest for a weaver continued outside the Orthodox community. The very first tallis in the B'nai Or pattern was made from reindeer wool by a woman in New Haven, Connecticut. This was lovely, but Reb Zalman still was not satisfied, because the cloth came out more like a blanket than a prayer shawl, and it hung rather stiffly. The search went on...Then one day, while visiting Montreal, Reb Zalman looked in the phone book and found the listing of "Karen Bulow -- Vetements Religieux" -- a religious vestment company? Would they be willing to do it? After a brief conversation over the phone, Reb Zalman ran ecstatically into the street and hailed the first taxicab! Yes, they could make it, but he would have to buy five of them, because it wasn't worth setting up the loom for only one. "Of course, yes, I'll gladly take five!" he said with delight. At last the five original tallaysim were woven: Reb Zalman got one, Abraham Joshua Heschel got one, Everett Gendler got one, Arthur Green got one... And the fifth tallis? I don't know. Perhaps it belongs to all of us, becasue these five tallaysim opened the door for Jews everywhere to begin personalizing their prayer shawls and expressing their own visions of Jewish spirituality. A few months later, Reb Zalman was hired as a "religious environmentalist" at a Ramah summer camp. So here was this Lubovitcher Hasid, combing the Manhattan garment district for colorful remnants, especially scraps with stripes and bright colors, so that he could teach Jewish kids how to make their own tallaysim. With a rented sewing machine and a trunk full of cloth under his bunk, he set up his "tallisarium, " the very first grassroots do-it-yourself prayer-shawl-making venture. Years passed, and those Jews taught other Jews, who taught still others. Reb Zalman never copyrighted his deisgn, so that eventually it was picked up and produced by a tallis factory in Israel, and marketed as the "Joseph's Coat" tallis. (Although nowadays, some manufacturers have toned down the original psychedylic "neon" "colors to more muted tones.) Today, multi-colored tallaysim are commonplace -- so much so, that a young man once walked up to the now gray-haired Reb Zalman and asked, "Where did you get your rainbow tallis? I also have one. Yours is exactly like mine!" Reb Zalman smiled lovingly. "Yes, Baruch HaShem [praise G-d], I also have a rainbow tallis..." He paused, a faraway look in his eyes, "...we're both wrapped in the Creator's Robe of Light." The vision had come full circle.